Little by little we are getting our office projects done. One of the tools I use every day is a Dry Erase Board, so having a large Magnetic Dry Erase Wall is even better. Rust-Oleum has some new products available at Walmart, so we gave them a try. 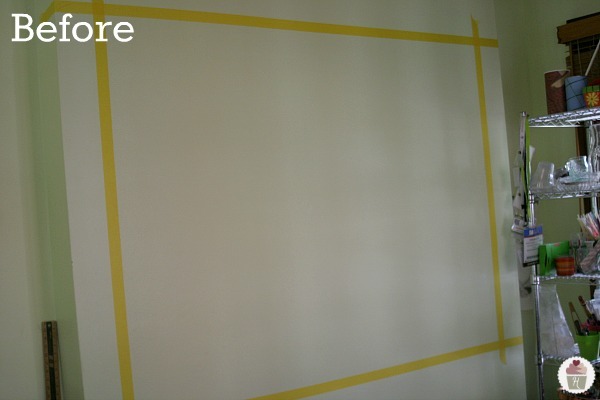 Doug started by taping off the area with Frog Tape, using his favorite Delicate Surface that comes in yellow. The tape is easy to remove and doesn’t pull the paint away like some of the other painter’s tape. Pretty cool, huh? Doug put together a video, and shared exactly how he created the Magnetic Dry Erase Wall with a few special tips he discovered along the way. 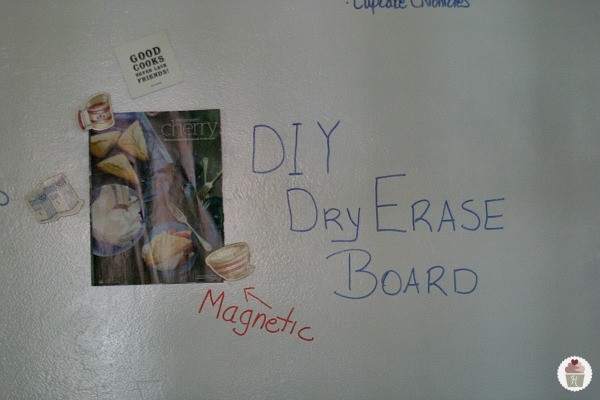 If you are adding Dry Erase over top of the Magnetic Primer, you will need several coats. We added 6 and probably will add a few more. Be sure to let the area cure for several days before writing on it, the longer the better. I’m loving my new Magnetic Dry Erase Wall…what do you think? Disclosure: This post is part of a campaign I am participating in with the Walmart Moms. Walmart has provided me with compensation and product for this post. My participation is voluntary and opinions, as always are my own. Hi. I love the concept and was going to do this for my kids playroom. I had independently E-Mailed Rust-Oleum before I found your video. The official response was that this was not a good solution, and your better off using the chalk board paint instead with the magnetic primer. They argued that you need three coats of white board paint to make this work well which would work against the primer. My question is how well has your solution held up? Hi Miles, I am surprised they would tell you that. Perhaps because they have had people complain. Personally we have not had any trouble. We are still using our wall, every day. I am happy to send photos of it if you want. It needs to be repainted now, but we have used it for about 3 years. We did put several coats on, but it has worked out great. How many coats of the both the primer and white board paint did you use? “Great question, Miles. 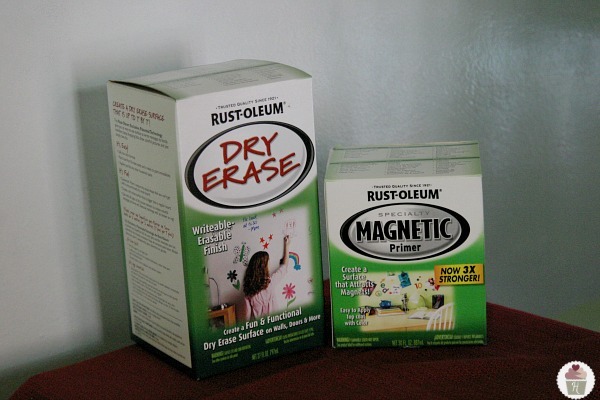 We do not recommend using Rust-Oleum Magnetic Primer and Rust-Oleum Dry Erase Kit together. The reason for this is that the Magnetic Primer works best when only 2 coats are applied on top of it. For Dry Erase Kit to work properly, 3 coats are recommended. 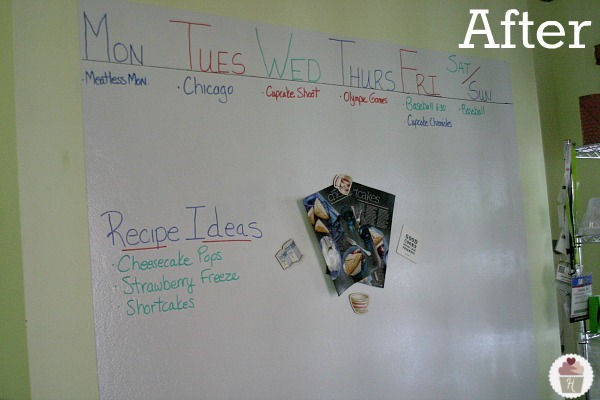 Instead, for a writable magnetic surface, use Rust-Oleum Chalkboard Paint with the Magnetic Primer! Hi Miles, I can only go by our experience, if the manufacturer thinks it’s not a good idea, then it would be up to you whether you want to try it. I asked my husband and he says he agrees with Rust-Oleum. The board IS magnetic, however the magnets we use are large, if you use small magnets, it doesn’t work as well. So – he used the recommended amount of primer, he thinks it was 2 coats (sorry it has been several years since he did it) and then 3 coats of the white board paint. 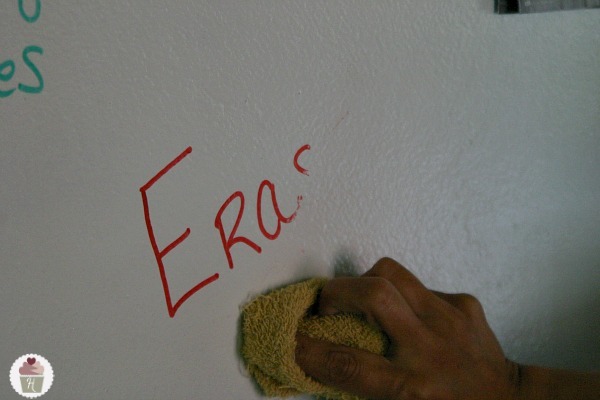 There is only one tiny section that is coming off for erasing for the dry erase. I used the dry erase spray and then a different purpose cleaner that I use around the house and the only part that is really working is a strip that kept dripping that had to be rerolled. The magnetic part is not really working. It’s so disappointing after spending $100 on this that it isn’t working well as I did a big wall. The chalkboard does work well though. I’ll probably add more coats on the dry erase part. Frustrating that it doesn’t work easier than it seems. Hi Kelley, I’m wondering about the wall you applied it too, that could have been the difference. The texture of the wall has a lot to do with how clean it will become. Our dry erase is working fine. I don’t think this is the issue. I am going to try more coats though. The black board is fine but the magnetic and the dry erase aren’t working well. Well the dry erase is working in the areas we used in the roller areas. Strange!! Hopefully adding some more layers will work. I think ours also worked better the longer it sat. We used it during that time, and it seemed to get better as time went on. Hi this past week made a magnetic with dry erase on top. We’ve waited 6 days to write on it. I thought the longer the better. Tonight the lighter colors didn’t have a hard time erasing but the darker colors did. Did you have an issue with this? Either way what do you use to clean the board. Also how well does your magnetic work? Mine isn’t really working. Any advice at all?? Thanks!! Hi Kelley, the darker colors are definitely harder to get off, but they do come off. I use rubbing alcohol for the tough stains. As for the magnetic, ours does work, however we did notice that it doesn’t hold a heavy amount. When I read many other reviews and some comments from the manufacturer, it seems that the magnetic primer and the dry erase kit don’t go well together. The manufacture even says it should not work. It has been 2 or 3 years since you wrote your review. How is it now? Does still work or is there some issue? I just finished the magnetic primer. It works well so far. I would like to take the next step. Originally, I wanted to paint the Dry Erase paint. But now, I am very reluctant. Any comment will be appreciated. Hi Vincent, our board is fine. The magnetic and the dry erase work fine. The dry erase does need to be repainted now, but we use it every day and like you said it’s been a few years. But yes, I feel like they work fine together. I have a couple of white boards in a room which really look bad and are stained. I cannot get the black marker off of them and they need to be repainted as I cannot replace them. can I use the magnetic paint and white board paint on the white boards as they are not porous at all? Hey Fred, That is a great question. YES you can repaint your dry erase boards. First you will need a couple sheets of 120-grit and 220-grit sandpaper. Sand the board lightly first with the 120-grit sandpaper then follow with the 220-grit sandpaper. Then you’ll need to wipe the board down with a wet cloth then let dry overnight. Then apply the magnetic paint and dry rease paint according to the directions. Hope this helps. Nice. Were you able to get several coats out of one box of the dry-erase paint or did you buy multiple boxes? Also how frequently did you apply coats? I know the box says once mixed application has to happen within an hour. Hi Ryan, I was able to get 3 coats from each quart of dry-erase paint. And I applied each coat 20 minutes apart to fall within the application limits. Did you just paint right over your textured wall? Did you sand it down or have a flat wall to start? It looks textured… if it is, did that cause any problems? Thanks for the video! Hi Laura, yes we painted directly on the wall. It’s a little textured. We did not sand it, and it has not caused any problems at all. Works great! When you say that you put on several coats, were you referring to the magnetic primer or the dry erase coat? Hi Stacey, several coats of the dry erase. VERY COOL!!! I will be putting on of these in my craft room! Thanks Doug for the great video..